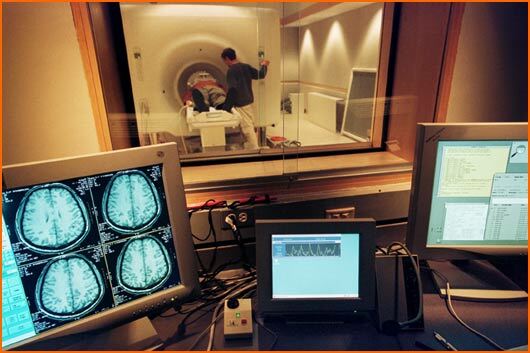 Monitors in the control room of the MRI scanner at the University of Wisconsin-Madison's Keck Laboratory. With this high-resolution "functional MRI" machine, researchers measure blood flow while the brain responds to emotional stimuli. Blood flows to active nerve cells, making the MRI the ideal gadget for watching the brain function. Photo: Jeff Miller, UW-Madison. Who invented the MRI machine? So far, we've spelled out why New York doctor, scientist and businessman Raymond Damadian deserves to be cut in on the 2003 Nobel Prize for Medicine or Physiology. The other side of the story rests on a distinction between points and images -- between one dimension and two, if you recall elementary geometry. Paul DeLuca, a medical physicist and associate dean for administration at The University of Wisconsin-Madison Medical School, says Damadian discovered how to distinguish healthy tissue from cancer by analyzing MR (magnetic resonance) signals from a single point in space. And that's the sticky wicket. The Nobel award was for medical images made with MR, and to make images, you would have had to measure many points, using Damadian's technique. In contrast, DeLuca says Lauterbur invented a technique for making images directly. "He recognized that by providing a magnetic gradient [a field that varies in intensity] to the whole region, you could look at many points concurrently, and that's how MR is done now." In comments to Science magazine, George Radda, an MRI expert at the University of Oxford (U.K.), said, "Damadian published some early papers outlining the concept," but that Damadian's idea for detecting cancerous tissue "did not lead to today's MRI" (see "Physicists Honored ..." in the bibliography). Radda said Lauterbur and Mansfield deserved the award from Nobel, the dean of dynamite: "There is no question that these are the right two people." Via email, Alexander Pines, an MRI expert at the University of California, Berkeley, concurred: ''...the award of the Nobel Prize to Paul Lauterbur and Peter Mansfield is deeply deserved and long overdue. In a creative leap of genius in the 1970s, working independently, they conceived of, and implemented, a novel approach to imaging that employs NMR [nuclear magnetic resonance] in the presence of magnetic field gradients. They demonstrated, using gradients varying in space and time, together with sequences of pulses and appropriate mathematical analysis of the signals, that the spatial distributions of the molecules of matter and tissue could be encoded and represented in the frequencies of non-ionizing, benign radio waves." Their methods made it "possible to visualize the insides of intact objects and subjects, forming the basis of what today is known as MRI." The Nobel committee, Raftery says, "did the right thing. ... I was under the impression that they were waiting for a long time; .... the question was, could they discern who had made the big impact? ...Damadian was looking at a small part of the picture." A composite MRI scan shows gray matter loss over five years, comparing 12 normal teens (left) and 12 teens with childhood-onset schizophrenia. Red and yellow show greater loss; front of brain is at left. Photo: © Paul Thompson, UCLA, courtesy NIH. We've already cited "The Pioneers of NMR," which called Damadian the inventor of medical MR, but that book has attracted serious flak. In a 1997 review, Paul R. Moran, a retired MRI expert from Wake Forest University, described the chapter on Damadian as "astonishingly biased, written as if to sell a political candidate." Although Damadian had written an interesting paper in 1971, Moran wrote, "It is truly ludicrous to propose then, that Damadian's scientific contributions even remotely approach the achievements of Lauterbur, Mansfield and their colleagues." Although the present dispute over the Nobel only prolongs the bitter argument over who invented what in the MRI biz, one thing is certain, DeLuca says: "They absolutely had to give a Nobel for MRI. You are talking about a technology that is absolutely pervasive." Before surgeons separate conjoined ("Siamese") twins, as they did earlier this month in Texas, you can bet the MRI machines are humming. Whether you are analyzing a bad back, a bad brain, or a bad cancer, MR is often the diagnostic tool of choice. Non-invasive, clearly showing soft tissue, MR is also harmless, unlike CT (computed tomography -- AKA CAT) scanners and other X-ray techniques. The immense MR magnets are put to medical use about 60 million times a year, according to the Nobel folks. If MR has attained unique status in the world of medical imaging, Damadian's public campaign for recognition is likewise noteworthy. Although "it's certainly not unusual that individuals feel they were wronged, or should have gotten a Nobel prize, I have never heard of any individual who took it upon himself directly to challenge a committee," says J. Rogers Hollingsworth, a retired professor of history and sociology at the University of Wisconsin-Madison, who has studied the process of biomedical innovation for many years. "That is unusual; most unusual." Nobody questioned by The Why Files thought Damadian will change any minds in Stockholm, and several deemed his ad campaign unseemly. But a century ago, whining by one physicist did not damage his chances for a Nobel. Philipp Lenard, a physics professor at the University of Kiel, Germany, had messed with an apparatus like the one Wilhelm Roentgen used to discover X-rays. Roentgen won the first Nobel for physics, in 1901, but Lenard missed X-rays. He also missed the discovery of the electron, which snared the 1906 Nobel for physics. As told in "The Nobel Prize" (see bibliography), Lenard vainly and disingenuously claimed credit for both discoveries. Nonetheless, he won the 1905 Nobel for physics for experiments on the photoelectric effect, which causes electrons to be released when light strikes certain compounds. And what of Nobel Laureate Lenard? In 1920, he denounced Einstein before the German Physical Society. According to Walter Gratzer of King's College, London, Lenard called relativity and quantum theory "a malign alien poison in the bloodstream of German science, a Jewish swindle" (see "The Waning..." in the bibliography). With this resume, you can hardly wonder that Lenard was eventually named Chief of Aryan Physics in Nazi Germany. 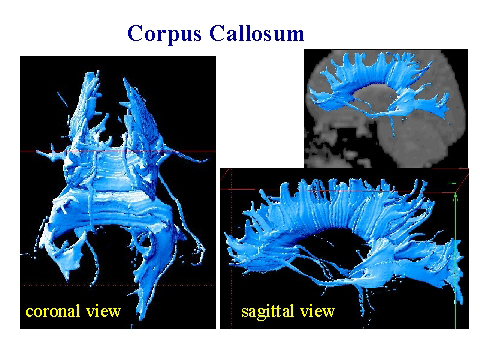 The corpus callosum, shown in a magnetic resonance image, is a huge bundle of nerve fibers linking the brain's two halves. Photo: NIH. When Alfred Nobel set aside spare change from his dynamite business to award and reward scientists, did he envision their explosive impact? Indeed, how did the Nobel Prize become a worldwide "brand name" for peerless achievement in science (and economics, literature and peace)? As Hollingsworth puts it, the prize "has a kind of aura that it's acquired across time. By 1910, it had already attained a very high legitimacy, and was viewed as the most distinguished set of prizes." Part of the reason may reside in the extraordinary scientific accomplishments recognized by the first Nobels in the early 20th century. As physicists and chemists probed the atom and the universe, they came up with relativity, quantum theory and nuclear fission. If the average person could not (maybe still cannot) understand, why, say, gravity bends light (relativity) or particles can be in two places at once (quantum theory), many were still awed by the discoveries. The Nobels were also international, Hollingsworth adds. While the Royal Society in London's Copley Medal, another highly-sought prize, occasionally went beyond the British Isles, "This was the first prize that was quite global in nature." Oswald Avery clearly deserved a Nobel. Who?